Ten Speed Press, 9780399579264, 240pp. 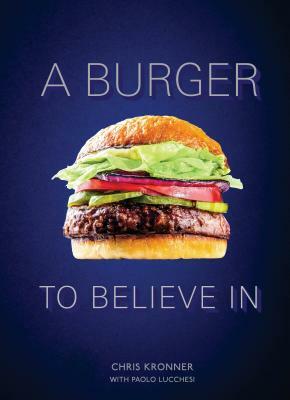 A deep-dive into the art and philosophy of making the perfect hamburger, with recipes for game-changing burgers and all the accoutrements. CHRIS KRONNER took over the kitchen at Slow Club at the age of 24. He has worked at Serpentine and Bar Tartine, where he continued to hone his burger chops, and after a run of pop-ups he opened KronnerBurger in 2015. He and the restaurant have been praised by writers from Vice, Eater, Food & Wine, and Bon Appetit. PAOLO LUCCHESI is the editor of the award-winning food and wine section at the San Francisco Chronicle and was a founding editor of Eater. He is the co-author of Flour + Water: Pasta and The Humphrey Slocombe Ice Cream Book. "Backyard grillmasters eager to amp up their burger game will find that Kronner’s debut lives up to its title." "In sum, Kronner not only gives us a perfect burger, but plenty of things to nosh on before, during, and après burger. "The Burger King, Hamburglar, and Wimpy excepted, few people—real or imagined—have obsessed over burgers like Chris Kronner has. And it shows. One juicy bite of his meticulously constructed signature Kronnerburger (or a flip through the pages of the meaty manifesto you are now holding) proves that burger brilliance is about more than just patty, bun, and toppings. It’s architecture, curiosity, heritage, and old-school passion that elevates the tasty to the transcendent." "Funny how hamburgers and caviar are alike: if you’re going to indulge, indulge in the best. Chris Kronner’s burgers have always been beluga-level. With A Burger to Believe In, Chris brings it all home, from every kind of succulent meatiness to salads that will tempt even the most dedicated carnivore. Whether your party is for two or twenty, a celebration or a simple meal, if crunch, savor, comfort, and flavor stoke your appetite—that is, if you are a living human—then this cookbook is for you." "The first time I ate at Kronnerburger, Chris served me the Platonic ideal of a burger—it was simple and exceptional all at once, without a single unnecessary accoutrement (if you like foie gras on your burger, keep moving). For us salad/burger acolytes, a perfect meal speaks its own name. A perfect burger is a parade of excellent ingredients brought together with a confident hand. It was quite literally, the burger of my dreams." "Making a really perfect version of a simple food—a burger, a brioche bun, a country loaf—is more complicated than people realize. Chris Kronner has been obsessing with the singular idea of a burger for more than a decade, painstakingly dissecting its components and techniques, and then elevating them. At the end of the day, the burger is an epic sum of its parts, a utilitarian vision. The Kronnerburger is not a super-fancy gilded burger; it is the classic American sandwich—in the best possible version of itself."